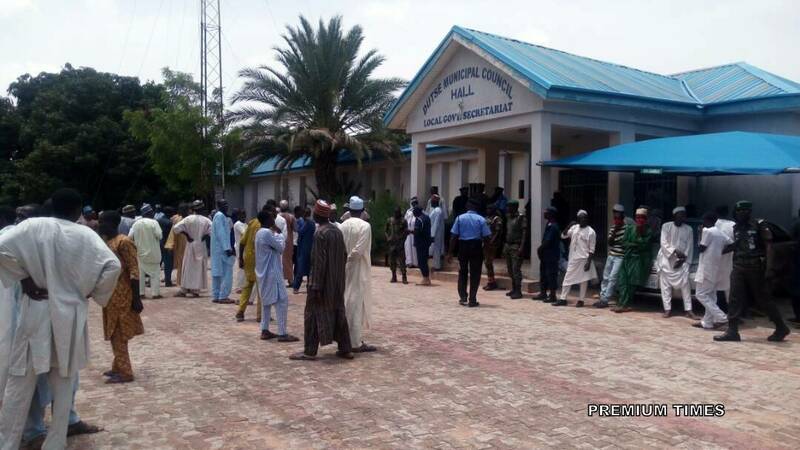 On Monday, hundreds of persons attacked and held hostage, the chairman of Dutse Local Government Area of Jigawa State, Bala Yargaba, Premium Times reports, adding that the council chairman’s attire was shredded to pieces. According to the online news portal, the mob accused Yargaba of non-payment of polling unit development fund meant for disbursement. The fund, which was passed into law in the state in May, is aimed at addressing the needs of communities such as installation of borehole, drainage maintenance, e.t.c, according to Premium Times. Each polling unit gets N50,000 per month, with some getting up to N150,000 depending on the availability of funds. The mob had attacked Yargaba, but he found his way into the local government secretariat. The mob then surrounded the building until the arrival of police and army officers. The mob, according to Premium Times demanded that Yargaba disburse the funds, with some saying he had replaced some of the beneficiaries with those loyal to him. Yargaba denied the allegations and accused the Dutse representative at the Jigawa State House of Assembly, Musa Sule of plotting the attack. Yargaba said Sule changed the names of beneficiaries when the list was sent to the House of Assembly. Police spokesperson in the state Audu Jinjiri declined comment on the issue, saying the command has not yet been briefed. There is no violence in the air. When a house is dirty, it needs to be clean, that mean the leaders in nigeria has to know that, that the time of stealing what belong to the citizen is over. The leaders have to know the time to DO THE RIGHT THING is now. Nigeria is cleaning up, and the leader knows, that the old way of ruling is over, they have to do the right thing, e.g stop stealing and building Nigeria, then all this crime will stop. We only have Nigeria and I tell you., Nigeria is among the blessed country in the world. You are NOBODY in another country, let build Nigeria togehter. Leaders Wake Up. This should be done to all the leaders in Nigeria. I’m sure he will think twice before trying anything like this next time.